Why is the Watermelon Yellow Inside? - What About Watermelon? You are here: Home / Why is the Watermelon Yellow Inside? Although these watermelons appear similar to the common red fleshed watermelons on the outside, bright green with darker green striping, the inside tells a different story. 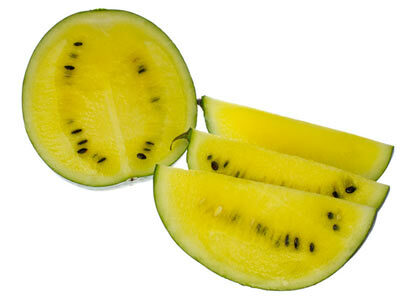 The flesh of a yellow watermelon can range from a light yellow to a deep golden yellow depending on the species. They can be round or more ob-longed shaped and come with or without seeds. Yellow watermelons can weigh up to 30 lbs (14 kg) but generally weigh anywhere from 5 lbs (2.3 kg) to 18 lbs (8.2 kg). This makes them on average half the size of the normal red fleshed varieties. 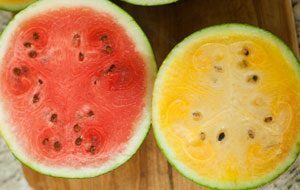 Although they differ in size, yellow watermelons have the same distinct crisp texture as red watermelons. Size comparison between red and yellow varieties. Although a close cousin of the popular red fleshed watermelons, yellow watermelons lack the red pigment and lycopene (an antioxidant) that give red watermelons (and similarly red tomatoes) their color. Yellow watermelons that are grown in preferable conditions and picked when ripe are distinctively sweeter than red watermelons. Their flavor is described to have hints of an apricot/honey mixture. Although Yellow watermelons can be grown in any season, during the summer is when they will flourish. 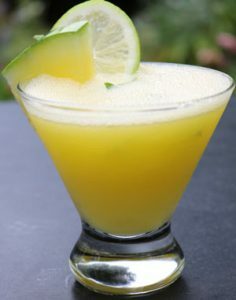 Yellow watermelons are best grown in warmer countries such as their origin, Africa or within the United States, Mexico or California. In the United States, Yellow Watermelons grow best during May to October. When the ‘Yellow Baby’ and ‘Yellow Doll’ varieties are ripe and edible, approximately seventy five days after planting, they should feel firm and be free of cracks. Once ripe, larger yellow fleshed watermelons should feel similar although have a longer growing period. Yellow watermelons need one square yard (0.9 square meters) of ground to successfully grow and temperatures between 70 to 85 degrees Fahrenheit (21 to 29 degrees Celsius). Yellow watermelons are a lot less common in the United States than the red watermelons. Although, it can be easier to find them at places such as farmer markets. 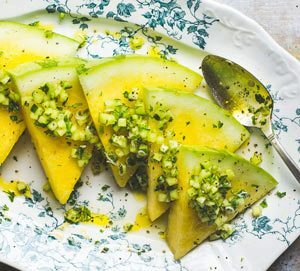 If kept in the refrigerator, a yellow watermelon can last up to two weeks. It is recommended that once cut you store your watermelon in a sealed glass container by themselves otherwise the amount of ethylene in other fruits can decrease their shelf life. thanks for being so informative. i was grossed out when i cut my watermelon open and it was yellow. i thought somebody planted the melon to close too the squash or maybe that it was rotten. it doesnt seem sweeter than the red tho. I did the same thing. I cut one open and I was like, what? It doesn’t seem sweeter at all. It is just OK. Wasn’t super impressed with the flavor. Where can I locate one locally.